Winter had definitely arrived, and looked as though it might hang around for a while. This usually means ice-axe and crampons, and perhaps a look at something steep and icy. Chris, however, doesn’t do ‘steep’ or ‘icy’, and although ‘Mist’ has 4X4 traction with fitted ice grips (or claws if you prefer) I didn’t think she would be up for anything serious. That wasn’t to be a problem, as a bit of snow on the ground transforms the most mundane walk into something interesting. 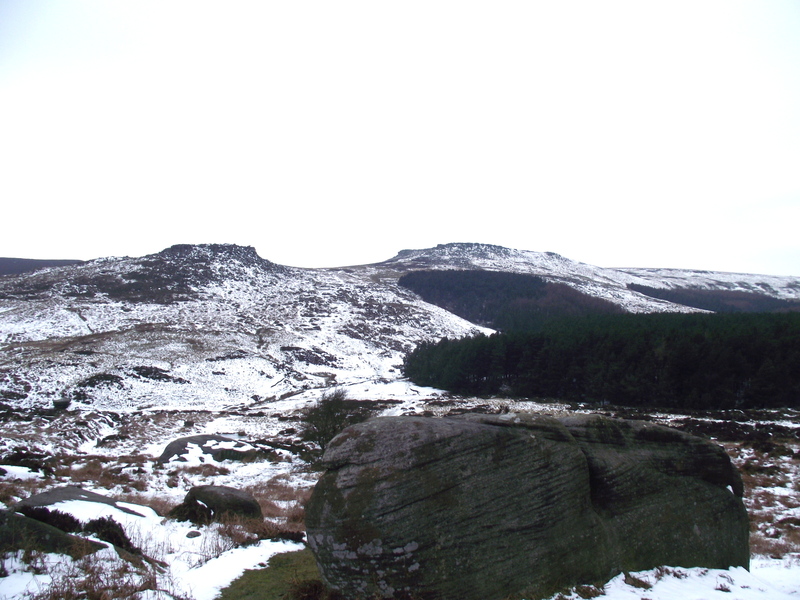 That’s not to say the circuit of Higger Tor and Burbage Rocks is a mundane walk. 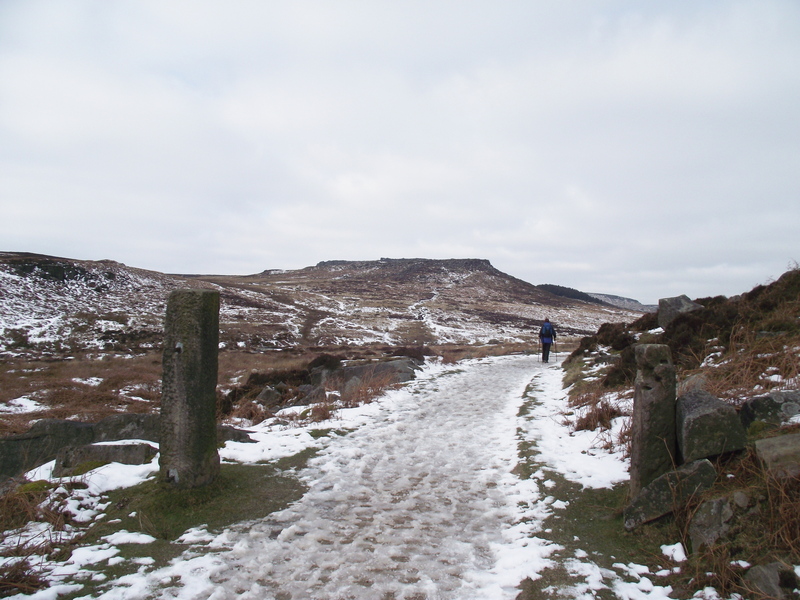 The route starts from the National Trust car park near Longshaw Lodge and initially follows the ‘Duke’s Drive’, a way taken by a former Duke of Rutland to reach the grouse moors at Burbage. 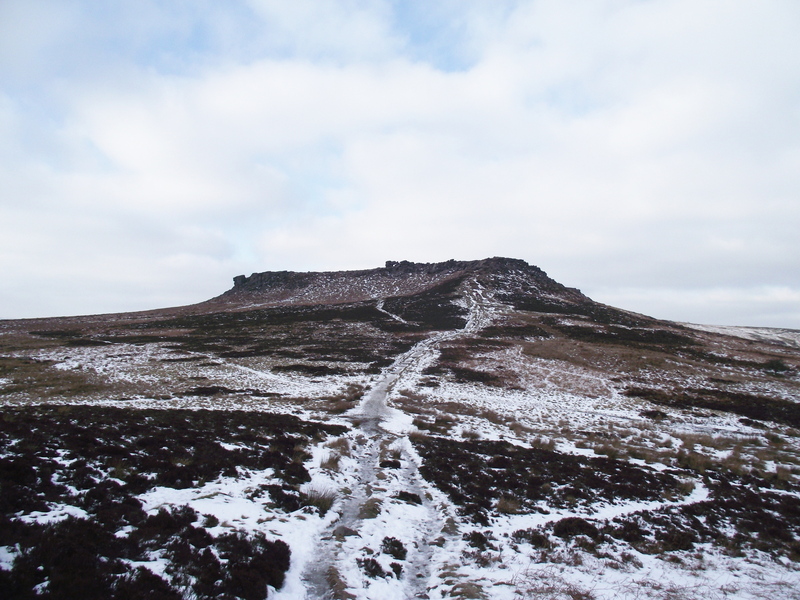 From there we were going to head for the intriguing monument of Carl Wark, followed by the summit of Higger Tor, before heading back down the Duke’s Drive. 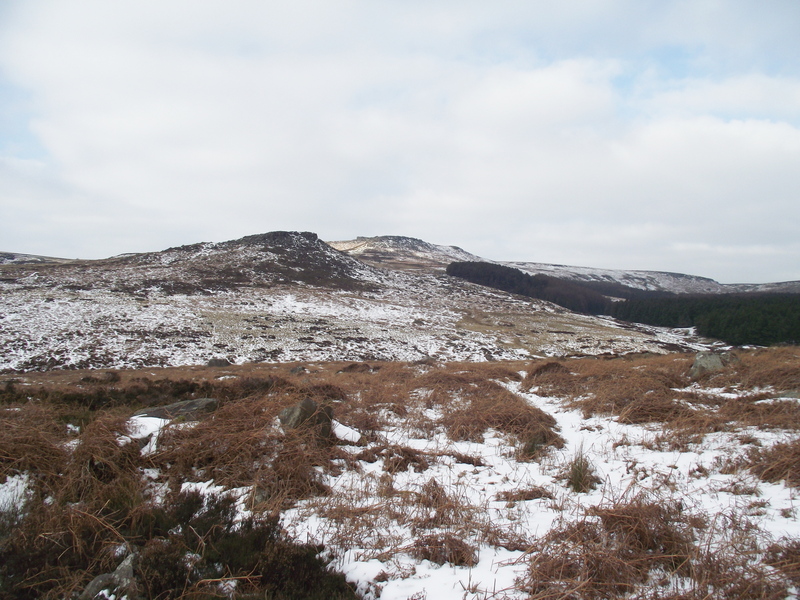 The Duke’s Drive – well frozen! 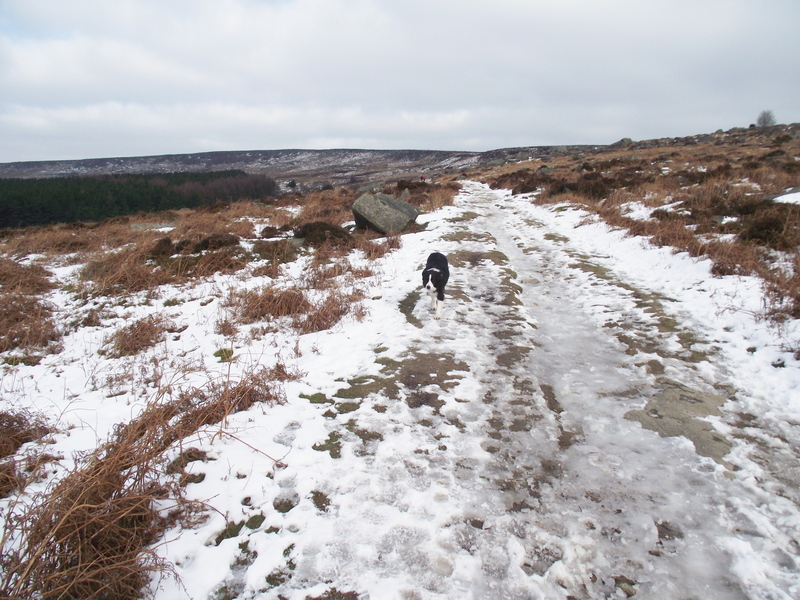 One thing was quite clear – the Duke hadn’t gritted the path! Fresh snow over the preceding weekend had been trampled by a good number of feet – the snowpack had then thawed and re-frozen a couple of times so that the surface of the track was now like an ice rink. Fortunately we had come prepared. 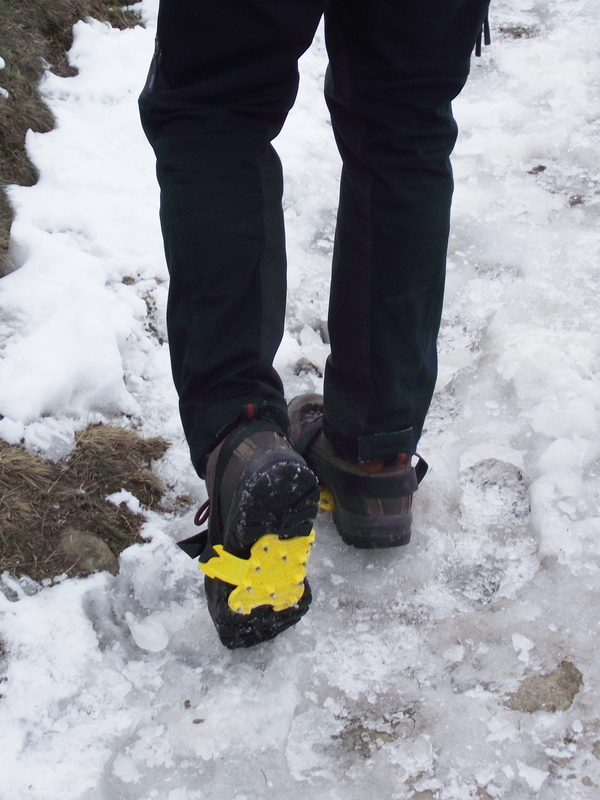 Chris has been using Grivel Spiders for a couple of years now – they are a simple but effective development of the old idea of instep crampons, with ten small points that bite into ice and hard snow. 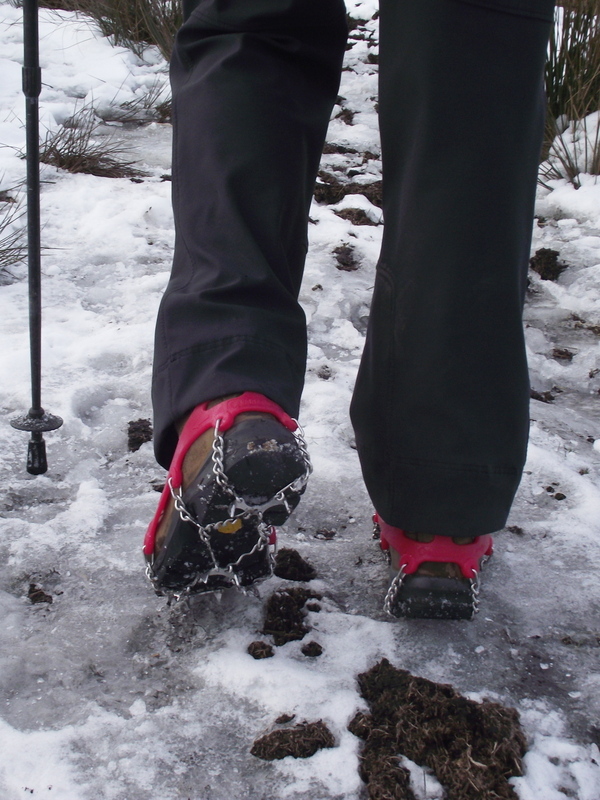 Our usual method is for Chris to wear her Spiders, and for me to slither about on icy paths because my 12-point mountaineering crampons are in the car. Today was different – competitors and staff on “The Spine” race had all been given a set of Kahtoola Mini-spikes for the event, and they were about to go into action for the first time. 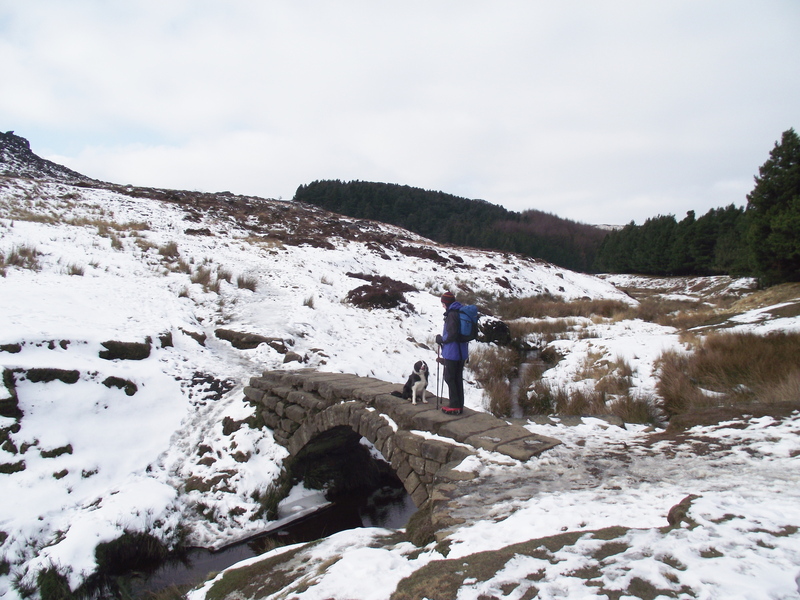 We stopped for food and a coffee by the 18th Century stone bridge below Carl Wark before hitting the first slope. I did the decent thing, and let Chris use the Kahtoolas – the Spiders were a better option than nothing for me, and ‘Mist’ seemed happy to get along with what nature had provided. 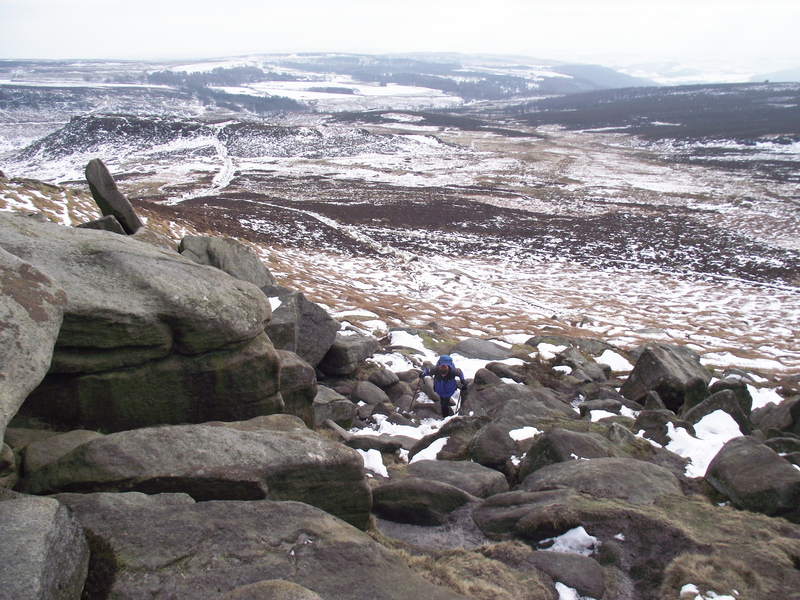 Although it only rises to just above 370 metres, Carl Wark dominates the approach from Burbage Bridge to the south. Once thought to be an Iron Age fort, it has now been suggested that there may be older links to the Bronze Age or earlier. 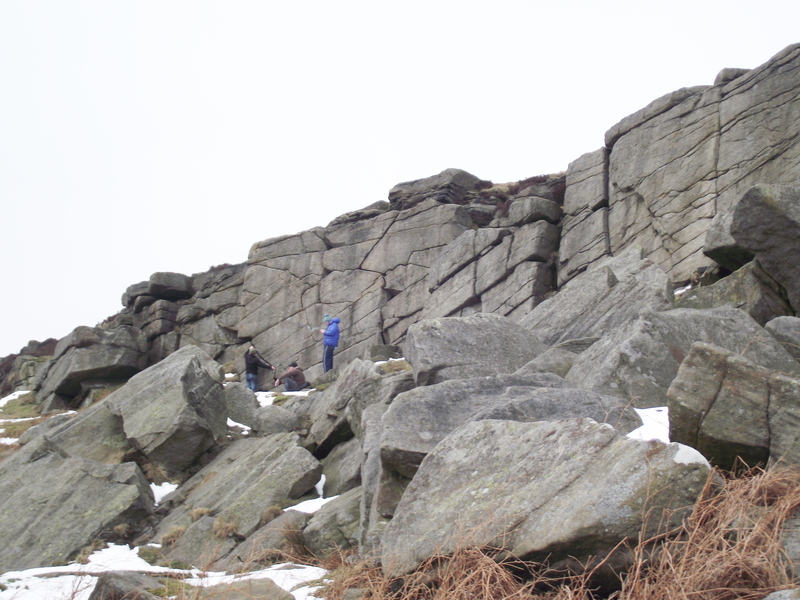 The existing natural cliffs and boulders have been reinforced by gritstone blocks, making a wall over two metres high, and although it was probably not permanently occupied, it would have provided a stronghold in time of danger. The unusual name may be Old Norse, meaning The Old Man’s Fort, the Old Man in this case being the Devil! Carl Wark must have looked ancient and mysterious even to the Danes. From Carl Wark it was a short stroll over to Higger Tor – at a mere 434 metres it proved once again that you don’t always have to go high to have a good day out. The light for photography was disappointing for the second week running, but you can’t have everything. 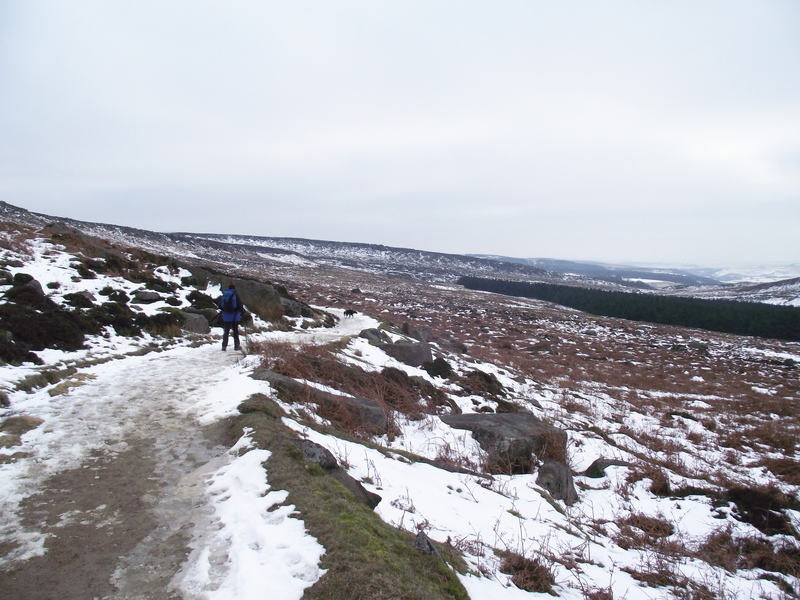 We carried on to Upper Burbage Bridge before returning down the Duke’s Drive. 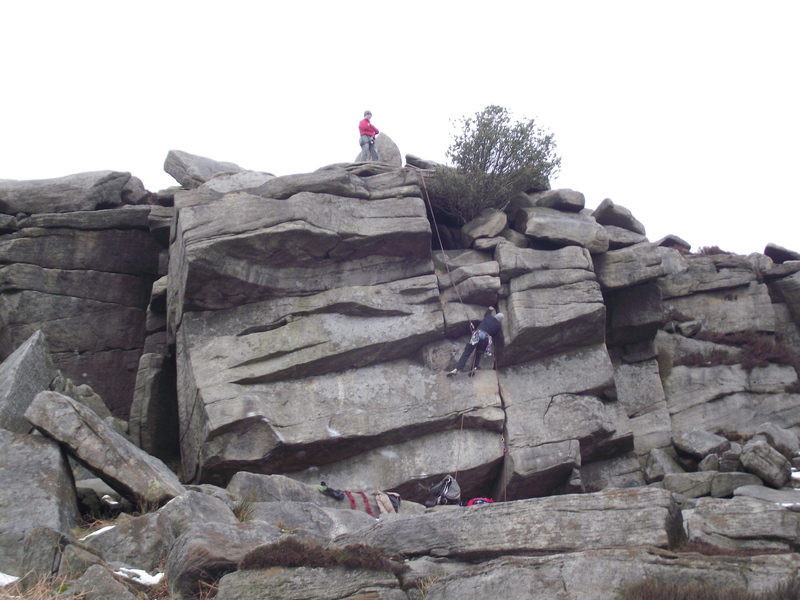 Burbage Rocks have their own history, at least as far as rock climbers are concerned – the rocks have been an important climbing area from the earliest days of the sport, and even in the cold conditions we encountered, a couple of groups of climbers were in action. We slithered on, back down the Duke’s Drive to the car park – although the Grivel Spiders have previously given good service, the Kahtoolas were a total success and I’ve already put in an order for a second set. 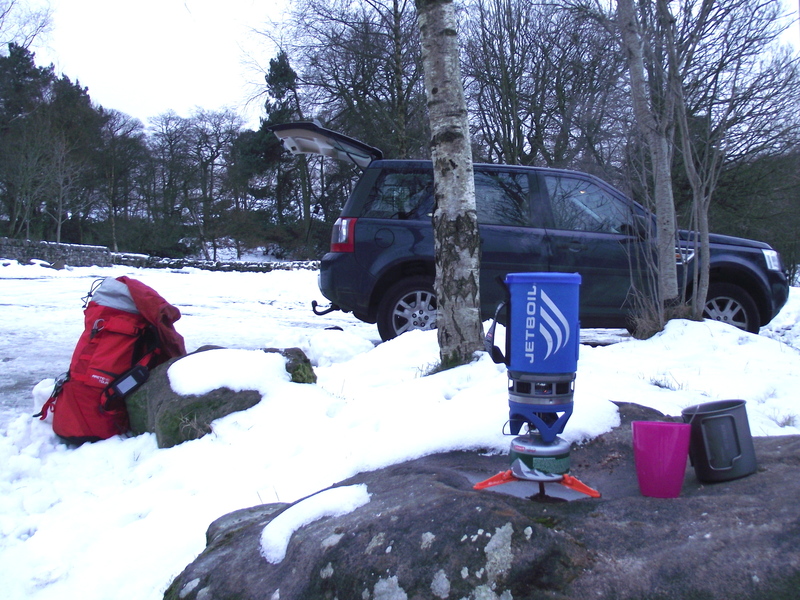 The other bit of ‘kit’ I’ve started carrying recently is a Jetboil stove – it’s amazingly fast, and weighs about the same as a flask. Hot chocolate at the end of the walk never tasted better! Back at the car park - more kit! This entry was posted in 4. 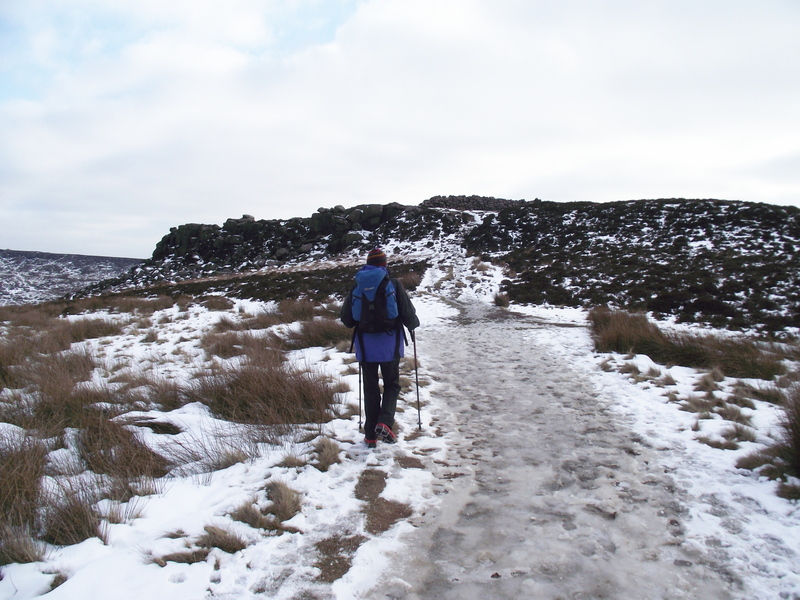 Northern England and tagged hillwalking, Peak District, Spine race, winter. Bookmark the permalink. Looks an ace day out, and great write up…if you get the chance have a look at the kahtoola KTS.. the spikes are great for icy paths skip of the rocks nicely. The Kahtoola KTS looks good, however I already use the Grivel G12 New Matics for serious mountaineering, and have found them to be great for most situations where the going gets steep. The Kahtoola Mini-spikes fill the gap (for me) where the G12’s are over-engineered but the path is lethal without some kind of grip. If I was starting from scratch, the Kahtoola KTS would be a serious contender. It looks like Kahtoola are going to a force to bereckoned with – look out all the traditional European brands! Looks a good walk. 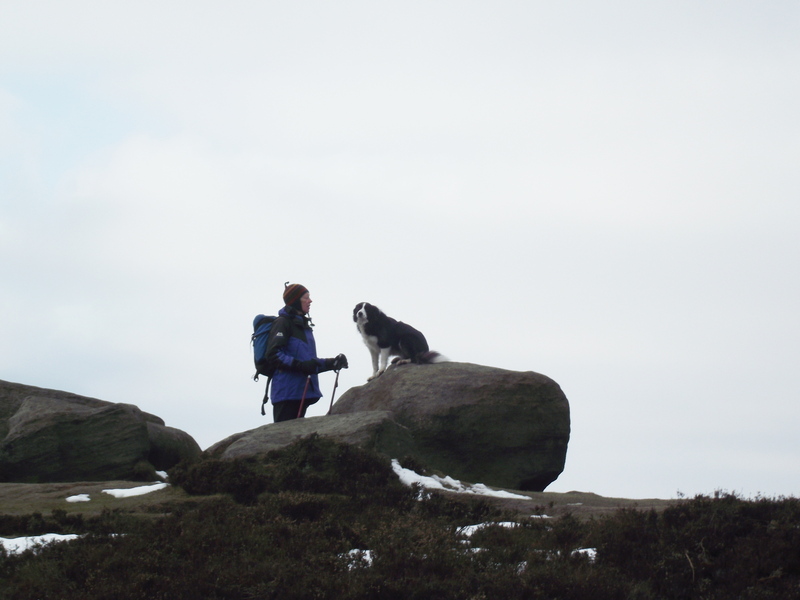 I’d take a trip to the Peak District but am very worried I’ll end up adding yet another ‘must visit’ walking area to my ever-expanding list! Yeah, I suppose that’s the trouble with looking on walking forums and reading walking blogs – you end up adding to your tick-list constantly! Hey Paul – glad you are putting the spikes to good use 🙂 I’m sure they would have made a real difference to peoples speed if they had used them in sections! I have a pair of the KTS and I have to say they are great for the tougher stuff and work on pretty much all footwear too! Dead right Scott – In the conditions on this years Spine race the mini-spikes would have given the grip required to run the icy bits quickly and safely. What I hadn’t appreciated until trying them was how quick and easy they are to put on and take off. That, plus negligible weight, should make them ‘highly recommended’ in the kit list for The Spine.